Please give me feedback on my art skills. home Home arrow_right Forums arrow_right Discussions arrow_right Creations arrow_right Please give me feedback on my art skills. You can't get honest feedback anywhere these days. Everyone's worried about hurting your feelings. I really really want to know if my art is bad or not, and if there is a way I can make it better. Here's the piece in question at the moment. I have been told to add more colors, but this is a design for my story, so I didn't do that with this one. I will try with others, though! Oh, by the way, the wing insides are supposed to be shiny and emerald-like... I need to know how to better pull that off. 1. Work on colors, hue shift and instead of making grey/grays 0 sat, give them some saturation. 2. Choppier shading. Not really choppy, but I'd kinda like more contrast in the colors, and not the same amount of contrast all around. very good, but the face seems like hes worried or something. other than that, pretty good! There should NOT be scales ontop of the wings! Other than that, cool. Usually I don't do that, but as a character in my story he has hollow scales on top of his wings to make his flight more silent (by breaking up the air) like an owl. I get where you're coming from, though. Maybe make edges a bit more rounded and black as the main color. Other than that Great work! You're asking me to change the whole color scheme of my dragon? I asked for advice on how to get better, not draw a whole different dragon, silly. psshhhhhh. i can draw a square (; Can you beat that? Oh yeah? Well I can draw a triangle. Yeah, someone addressed the wing position, I'll make sure to slant the wings back a bit more next time. Wasn't sure if I should make it like a snake or a sort of catlike tail shooting off the back. Went with catlike. Personally, I thought it looked long enough, but I'll experiment with tail length (and connection to body) a lot more. As for color, he was supposed to be metallic iridescent, -snip- it. I can't make either of those happen I'm very amateur when it comes to texturing/shading. looking at that dragon gave me another idea, you could like do the scales in a more variety of shapes and sizes to make it more interesting looking. I'll try that. 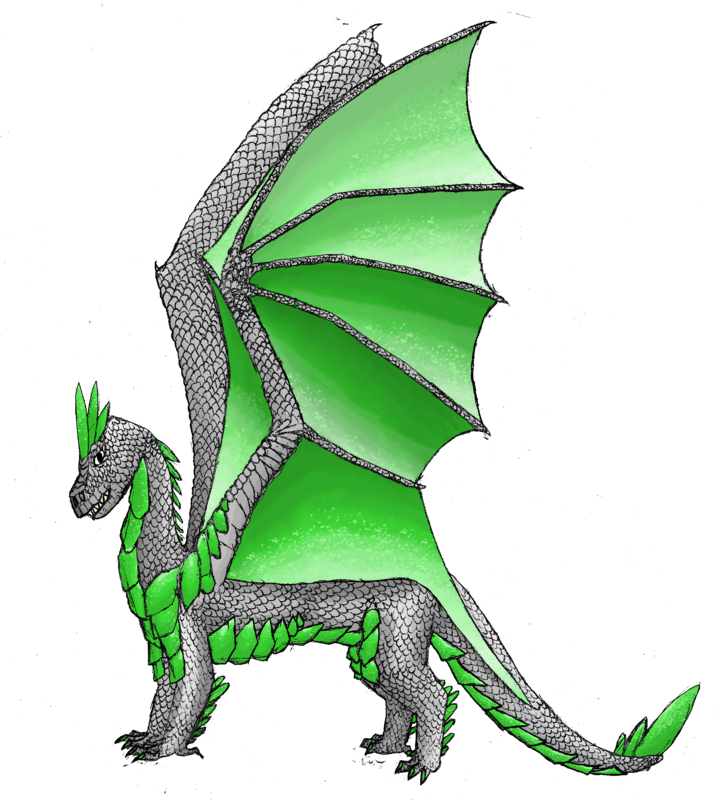 I tried to do that with the emerald scales and some of the ones on the wing arm. 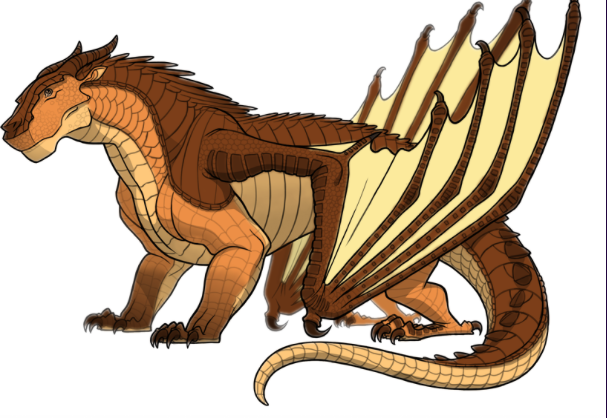 The ones down the body are sleek and sort of loose, like chainmail armor in my mind, but I could probably add a few more scale layers like in Clay (the inspiration dragon in the picture, a character from Wings of Fire). Pretty good, but I think the nose should be a bit pointier. Hehe, everyone's saying that. He was inspired by a MudWing, but since everyone wants me to give him a prettier nose, I'll do that for sure next time! samkee00 Everyone's worried about hurting your feelings. The nose is to blunt, and not thin enough. The wings are at an odd angle, I'd expect them to fold backwards a little more. The tail connects to the rear in a strange way, and isn't long enough. -the shading could use some more work, you could definitely make the darks darker, and the lights lighter to give it more shape. -linework is a little strange when I looked at the zoomed up picture, did you like use the spraycan tool or some other similar thing? It is kinda an interesting look but looks strange up close. You should try for more solid lines. -little bit messy, you could have done some better cleaning up, like especially around the right set of feet there is some speckled marks in the background that are distracting. There is a few random white spots on the dragon also that could be cleaned up better. -maybe more interesting color wise? the piece is mostly 2 colors which is fine but you could have hue shifted or like added speckles maybe a slight different color to make it more interesting looking visually. I mean overall it is pretty decent, I like what you did with the basic form of having like an armored gem look. If you like dragons you should make some more designs, I would totally love to see more. This is a character from my story, and he's only two colors, so I made him two colors. I do like more colorful dragons, though. Shading is haaaaard glad you like the speckles, though. It's supposed to be sorta... sparkly, I guess? Someone on deviantArt told me that putting scales all the way through the whole thing was dumb and that I should do them here and there. That only really works for fur, in my opinion. Thanks for all your feedback on my work! It's pretty good but maybe instead of the wings going straight up, have them come back on a diagonal. For a second I thought you meant folded or down to his sides, and I was about to be like "but that's not the position he's standing in!" I think your art is awesome, you should try new things. its nice. i like the scales tho i dont like the fact that the wings extend to the tail.